This utility is useful to show you received emails, and can be easily installed and configured whatever OS you use, Puppy or Dog, thanks to a deb file available for 32 & 64-bit systems. I was thinking this sounded like a useful FireTray replacement. But you know what? As soon as I read that it wants Qt5....I lost interest. Just like that. Qt5 is a bloated, over-sized complex monstrosity, bigger than Puppy itself. What's wrong with using GTK? So, just to add a little icon in my system tray that informs me when I have mail, I'd have to install Qt5? wow are you really so up to date ? ...despite that xcb is available & staring you in the face! I've run up a package for 64-bit 'Bionic'. I tried doing a package for 32-bit Bionic, but am currently having problems with an accidental mix of Qt5 versions, so I'm holding back on that for now. Like FireTray, you can use the tray icon to display/hide T-Bird. If you accidentally close T-Bird, it can be set to auto-restart again. If you want this to auto-run at boot-time, just drag/symlink /usr/bin/birdtray across to /root/Startup. I haven't added this to the pet, because not everyone will want it to autostart. There's a Menu Entry to start it manually; Menu->Internet->Birdtray. You can find the 64-bit package here. Run at your own risk; the article at linuxuprising.com clearly states this is alpha-quality software, although it seems fairly stable, for all that. The .debs available are only for Bionic Beaver and Cosmic Cuttlefish anyway, so I can't guarantee they'll even run in any other 64-bit Pups, let alone any older ones. Um....yeeah. Good job it only wants a few modules; the full Qt5 package is at least twice the size of whatever Pup you're running there..! It annoys me, because everyone and his dog was happy with GTK2/3 for years & years (nice & simple). Then they all started using Qt3.....then Qt4.....and now it's Qt5, which is a monster. And now even teeny little apps (like this) are being written to need it. Unfortunately, it's a sign of things to come.....and partly why Pups are getting bigger and bigger. Welcome to the world of Windows hyper-complexity! 1) Update the PPM first (always a good idea). This will pull in libqt5dbus and libqt5network, plus libdouble-conversion, libxcb-xinerama, and one or two others. 3) Install norgo's pet from the above post, birdtray-1.3-qt5-i686. All things being equal, it should fire up from Menu->Internet->Birdtray. If you want this to start at boot, sym-link /usr/bin/birdtray into /root/Startup. Configuration takes a bit of fiddling about. Birdtray works by reading the global-messages-db.sqlite database inside your Thunderbird profile; this makes it independent of T-Bird version, and should continue to work well into the future. When it fires up for the first time, it'll ask if you want to set up the profile. OK this, and it'll take you into the settings. The first tab to concern yourself with is the 'Monitoring' tab. First time you click on this, it'll tell you it can't find the profile, or something similar. Hit 'Cancel' at the bottom to exit the settings. 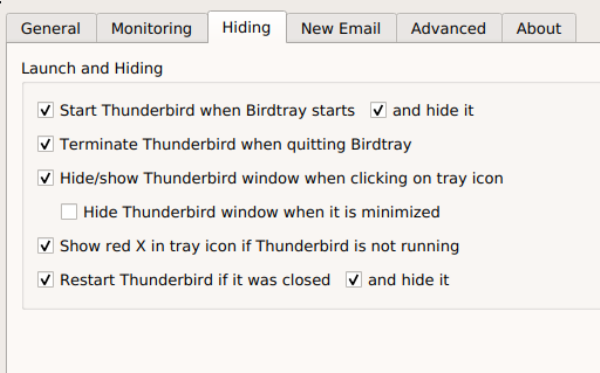 If Birdtray is showing in the notification area (a Thunderbird icon, probably with a red cross through it), right-click->Quit. There doesn't seem to be a way to correct the profile problem from within the app's settings (remember, this isn't 'stable' yet). So, open ROX; click on the 'eye' to show hidden files; and go into ~/.config->ulduzsoft (which norgo mentioned above. I had to use this in Bionic64, too). Open the 'birdtray.conf' file with Geany. Make sure to copy those letters & numbers correctly. 'Save', and exit Geany. Now, re-start Birdtray. Once again, you'll asked to set things up. In 'Settings', under the 'Monitoring' tab, the previously greyed-out text should now be black. It may still not want to behave itself, though. There may be a window with something about the 'parser needing to clear database/account'. Click 'No' to this. Top-right corner, the 'Method to parse unread notifications' dropbox is probably showing 'Using Mork index files (recommended)'. Uh-uh. We don't want that, so change it to 'Using global search database'. That's better. There should now be a box showing - 'Profile database to monitor' - with your T-Bird profile path in it.....and the 'Add/Edit/Remove' buttons are now active. Now you can use the 'Add' button to add whatever email 'Inboxes' you want it to work with. You can also set a different color for the tray icon's numbering for each a/c, so you can tell at a glance which one it is before you use the icon to open T-Bird. A word of warning: Don't enable the inset line 4; 'Hide Thunderbird window when it is minimized'. Apparently this is a known 'bug', which its author acknowledges needs to be fixed. If you enable it, you'll crash the app, and you'll have no end of trouble getting it to run again!